Come and enjoy our Waterfront Beach Cottage. The Cottage is located on Bainbridge Island in Puget Sound. It has stunning southern views of the Sound, Mt. Rainier, and Washington State Ferries. The Seattle skyline and lights are viewable from the bulkhead and fire pit. It is a fabulous place for a stress-relieving break or more active pursuits. One of the things we enjoy most about our cozy cottage is watching local wildlife. Bald Eagles are easily seen from the home and deck. Seals, sea lions, cranes and other critters pass by daily. Orcas played off our beach from time to time. What a treat! At low tide, throw on your water shoes and head to the beach to visit tidal pools brimming with colorful starfish and sea anemones. It’s great for anyone with a curious mind and young at heart. The Cottage is situated along a popular and busy maritime route with Mt. Rainier as a backdrop. The water is studded with ferries, naval ships (including aircraft carriers and submarines), ocean-going ships, sail boats, yachts, kayaks and even paddleboards. If you like, you can use our 4 kayaks to explore for yourself! Another option is to use our four (4) hybrid/mountain bikes to ride along the largely flat South Beach Drive into Ft Ward Park and then on to Lynwood Center (Pleasant Beach). Enjoy the art house theatre, bakery, restaurants, cafes, boutiques, ice cream, small grocery and a Sunday farmers' market. Or visit Winslow, where the Seattle ferry lands and also the Island's primary shopping district. Winslow is 6 miles from the Cottage. You'll find everything you need including groceries, retail therapy, parks, walking trails along Eagle Harbor, movies and many excellent restaurants and pubs/winery tasting rooms. If you want to play golf there are several in the vicinity. If gambling is your fun, a casino located just off the north end of the Island. For cycling enthusiasts, Bainbridge Island is a well known bike riding destination. The Island is blessed with trails and walks close to the Cottage, but also throughout the Island. The Island is home to several award winning wineries and a distillery. The grapes come highly regarded Eastern Washington vineyards. The tasting rooms are eclectic, friendly, fun & scattered through Winslow and around the island. Or, if you are just looking to get a break from it all, you most certainly can find relaxation and a retreat in our cottage all by itself. No need to leave. All rooms have water views. The cottage features a beautiful and extremely well-equipped Kitchen. The very comfortable Living and Dining rooms provide captivating views of the comings and goings on the water and the lights from West Seattle. In the evening, the illuminated ferries will remind you of Christmas ornaments. The 2 Bedrooms have queen beds, flat screen TVs, and hummingbird feeders that attract birds from dawn until sunset – year round. The "Middle Room" has a queen size sofa bed. Firm, comfortable, no back breaking bars to disrupt your slumber. Both Bathrooms have skylights to gaze at the sky & tree boughs above. The Master Bath has a low curb, walk-in shower with a small seat. The Main Bath has a claw foot tub where you can relax. The Deck enjoys sun during the morning and early afternoon and then shade in the afternoons. Relax on the outdoor furniture, have a sun-filled breakfast or lunch and watch the eagles soar past. Continue down the steps towards the water for areas where you can sit and enjoy views of Seattle skyline, relax in a two person hammock, enjoy the fire pit, paddle kayaks, or hop down to the beach to explore tide pools and collect shells and rocks at low tide. We split our time between Seattle and Bainbridge Island truncated by attacks of wanderlust for travel. We enjoy sharing what we know and love about Bainbridge and Seattle. The View!!! From the moment we walk through the front door, we were stunned by the views of the Mountain and the Sound. Our original plans were to re-build and modernize the cottage, but instead, we improved it and still love it. We lived here for two years and commuted to work from the Island. We have found that the cottage is a fantastic place to 'chill' or 'get jazzed'. We love the feeling of being away from it all, but its only a short distance into Island centers - Winslow or Lynnwood where dining, pubs, entertainment and shopping options are numerous. Additionally, Seattle is just a short ferry ride away. This place puts the 'C' in Cozy, the 'FUN' in Functional, and provides a bead on maritime and wild life comings and goings. Its a great place to enjoy the Pacific Northwest at its best. Whether from the comfort of the cottage, the expansive deck or down by the water, this is the place for you. The kitchen is well-equipped, with just about every kitchen tool or appliance. Additionally, the Hummingbird feeder at the kitchen sink provides close encounters with the birds year round. Too cool! The living room is nicely decorated, and comfy. It's large windows on two sides provide a fantastic view of the water and wildlife moving past. The expansive wrap around deck provides a bird's eye view of the water, the mountain, wildlife and maritime traffic. From the bulkhead you have a great view of downtown Seattle. Comb the beach and tidal pools for shells, beach glass, and starfish. 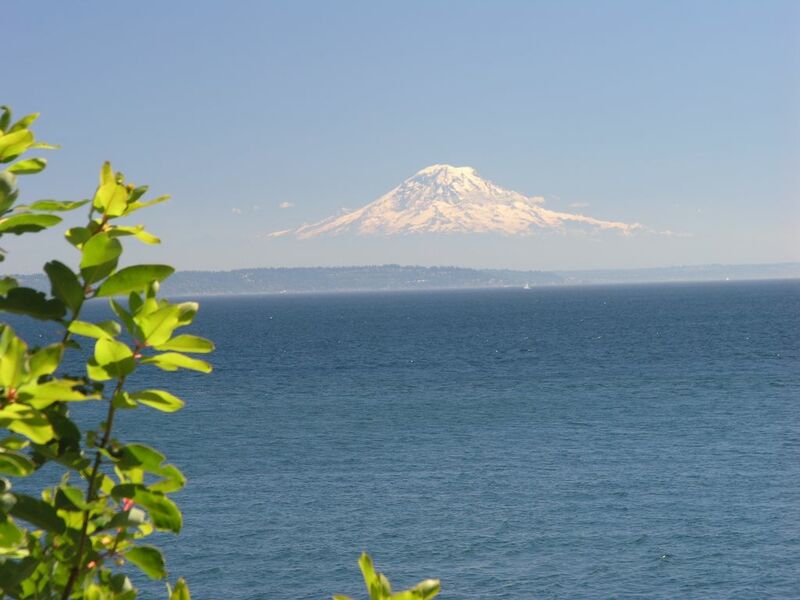 Our cottage is situated on the south end of Bainbridge Island with a fabulous view of Mt. Rainier. Ferries pass in front of the cottage hourly. At night, they look like Christmas tree ornaments. A water view chalk full of marine life, traffic, and a really big Mt. Rainier view. We are on the south shore of Bainbridge Island with views from Seattle City skyline and lights. Mt. Rainier is front and center with Blake Island and water views to the West. Ductless heat pump for main living area areas and electric oil-filled heaters for bathrooms. We have lovely high thread count sheets, down comforters and pillows. Washer and dryer are stacked in pantry. Front loading, easy to use. Detergent provided. There are two fitness centers - Island Fitness and Bainbridge Athletic Club. Additionally, the island has several yoga and other exercise studios. Stone fireplace in the living room has wood burning insert. Wood for burning is provided. It works well, just add dishes and detergent. Turn on. Drawers are filled with dishes and every imaginable utensil. Upper cabinets have water, wineglasses, and coffee mugs. Cabinets and Pantry contains small appliances and sundry items. Board games stored in corner cabinet in dining room. Bocce ball is in a deck box outside. Steps from the cottage take you down to the waterfront, and to a hammock that fits two! We now have four (4) kayaks which hold one person each. We have lifejackets of all sizes, but for best fit, bring your own. Use of Kayaks is at your own risk. We have five (5) adult bicycles for adults to ride (& Helmets) to ride. Enjoy a nice, 2.5 mile flat ride along the water & thru Ft. Ward Park to Lynwood Centre restaurants, shops & theater. Dinghy upon request to take you to your boat at our mooring ball. Expansive deck off living room where you can relax, lounge, and dine while watching the maritime traffic. Or follow the deck around for afternoon sun. The island has one public course and one private. Just off the island is another public course. While cabin is not ADA compliant, it is a single level structure and deck. Master bath has a low curb shower and assist handles. We fell in love with the 1912 cottage that has been through a few remodels over time, including ours. It is quaint and cozy, and enjoys some of the most beautiful vistas of Mt. Rainier, the water, and maritime traffic on the island. We are positive you will absolutely love it here. Thanks so much Deb & Rico for again letting us share your little piece of heaven. Ironic that your VRBO profile pic is exactly what we woke up to every morning. :) It was a very relaxing stay and we were so pleased that we got to spend it at your place. As many times as we've been to your place it never gets old. See you again in 2020! Well equipped house. Lots of room. Very cozy. Tremendous views. Wonderful home. The owner, Deb, is awesome. Great communication. Had the home warm and ready for us. Basket of goodies, breakfast in the refrigerator. Very welcoming. Even though we spent most of our time with grandchildren at their house, this home is great. Recommend it highly. Views incredible. Seals almost every day. Loved it. Words can't begin to adequately describe how lovely this home is- the view, the cozy factor, the detail with which it has been decorated and set up for guests- absolutely perfect! Before our arrival, Debbie (owner) prepared the cottage- the heat was set, hummingbird feeders filled, decorative deck lights on, wine, snacks of all kinds and staples were all there for us! Wow! So many nice touches! After this experience, i won't be able to stay anywhere else on the Island! I loved the place so much, that before I left, I reserved it for another week this summer! Can't wait for my next visit! Thank you Debbie for sharing your beautiful home! Absolutely enjoyable! Magnificent views and ask the comforts of home!!! A week was not long enough at this wonderful cottage. As soon as you walk through the door the view is incredible. On a clear day Mt Ranier is right in front of you and although we only caught a glimpse of the top, it was majestic. The house is just lovely. We arrived to a basket of goodies (wine, candy, fixings for s'more, oatmeal and fruit) and in the fridge we found the makings for breakfast. We had two "shore" dinners with fresh seafood from Pikes market and the chefs kitchen has everything! We enjoyed dinner on the HUGE deck and later had a fire down by the water in the firepit and stuffed ourselves on the s'mores. I especially loved the bathroom with the clawfoot tub and the clear glass ceiling, it was like taking a shower outside. There were robes hanging in the closet to wrap yourself in after a nice long bubblebath. We loved exploring Bainbridge Island but looked forward to getting back just to spend time at the house. Last but not least, the rental owner, Deb, was so delightful and easy to work with. She made sure we had whatever we needed and was so helpful with advise on what to do and where to dine and was thoughtful enough to send me a schedule of the ferry. She certainly made us feel welcome. I highly recommend South Beach Cozy cottage. You won't be disappointed.